Shares in Levi Strauss were flying off the shelves as the blue jeans company made its return to the stock market. The price shot higher immediately Wall Street opened, and closed up 31.8%, valuing the company at $8.7bn (£6.7bn). The 166-year-old business, which struck gold when the founder patented the use of rivets in clothing, has about 5% of the global jeans market. 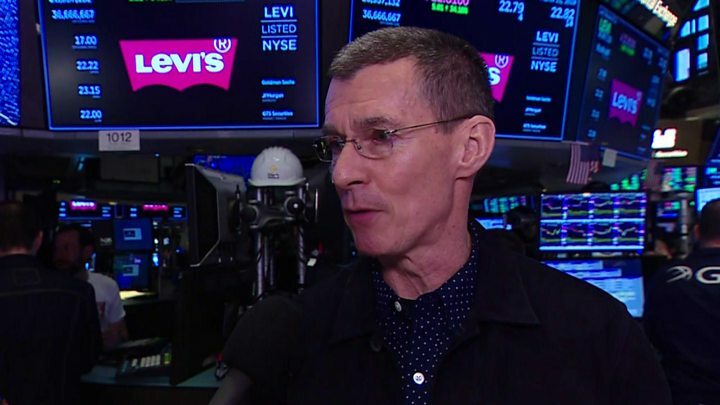 "The IPO [initial public offering] is not a finish line, it's a new starting line for us," chief executive Chip Bergh told the BBC. "I don't feel like my job is done. I came here to get this company turned around, to make the Levi's brand what it was when I was a kid, back the way I remembered it. There's still a lot of work ahead of us," he said. The flotation comes at a time when fashion experts say there is a new popularity in denim among consumers, driven by the resurgence of 1990s styles such as high-waist and pinstriped jeans. Levi first went public in 1971. But after 14 years, it was taken private by the Haas family, the descendants of founder Levi Strauss, in a $1.6bn buyout. That saddled the company with big debts, something which Mr Bergh said weighed down the business for years. Shares for Thursday's IPO were priced at $17, above the expected range, in an offering that was heavily oversubscribed offering. At the close the price was $22.5. "The company and the underwriters targeted a reasonable valuation and allowed the true investor demand to dictate price," said Jeff Zell, senior analyst at research firm IPO Boutique. Founder Levi Strauss moved to San Francisco in 1853 during the California gold rush, opening a dry goods business. In 1873 he and a partner received a patent on using rivets to make clothes more durable. Analysts said the success of the listing bodes well for investor appetite for other flotations planned this year, including Lyft, Uber, Pinterest, Airbnb and Slack.